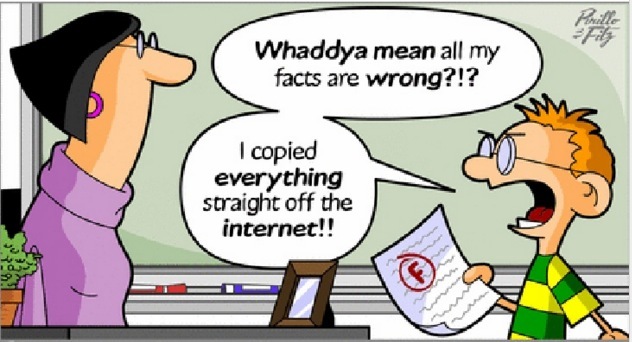 If imitation is the sincerest form of flattery, consider us…flattened! Some local politicians, forced to deal with our truthful crime reporting, love to bad-mouth us. But it now appears that at least one of those aldermen is using us as a reliable source. 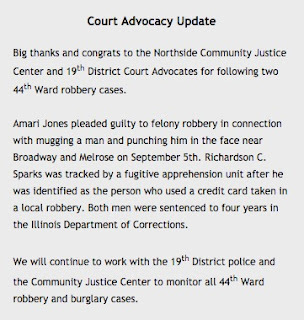 Tom Tunney, who represents the Wrigleyville and Boystown neighborhoods, published his weekly newsletter today and….the section about two recent robbery convictions sounds familiar. Amari Jones, 19, pleaded guilty to one count of robbery in connection with mugging a man and then punching him in the face near Broadway and Melrose on September 5. 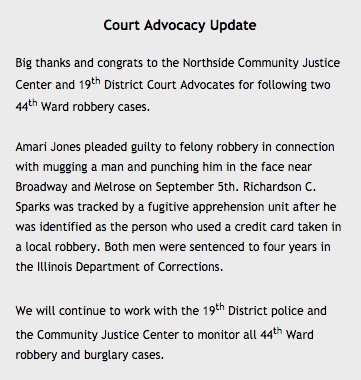 Amari Jones pleaded guilty to felony robbery in connection with mugging a man and punching him in the face near Broadway and Melrose on September 5th. Richardson C. Sparks of the Auburn Gresham neighborhood was tracked down by a fugitive apprehension unit after he was positively identified as the person who used a credit card taken in the robbery to buy food at the Subway restaurant, 901 W. Belmont, moments later. Richardson C. Sparks was tracked by a fugitive apprehension unit after he was identified as the person who used a credit card taken in a local robbery. Welcome to the growing CWB audience, Tom! If you'd like to help cover the time and expenses involved in our newsgathering and writing, you can make a donation here, alderman.